Board the boat in Palma. Before leaving, take time to visit the town, see the gothic Le Seu Cathedral and do some shopping. Food enthusiasts should head to the Olivar market (open every morning except Sunday). Alternatively, take a taxi to the Pilar and Joan Miro Foundation to experience its great art and unique architecture or to the circular Bellver Castle, which offers fantastic views of the town down below. Once back aboard the boat, navigate along the coast and anchor in one of the deserted natural coves for the night. Sail to Cabrera, a small island to the south of Mallorca. Cabrera is a protected nature reserve with lots of charm and history. Enjoy spending time exploring the island’s caves, such as Se Cova Blava, and its numerous tranquil inlets with aquamarine waters. Dolphins are regularly spotted in this area so you may be lucky and see some as you sail around. The 14th century castle overlooking the port can be reached on foot and from here you can take in the views across the island to where the sea meets the sky. Dinner on the boat and overnight anchorage. This morning, set sail for Formentera. Discover this preserved territory, otherwise known as “the last Mediterranean paradise” which offers stunning beaches with long stretches of white sand and crystal clear waters. Choose a place to anchor, such as the Playa Llevante or Playa Es Caso, or sail past the northernmost tip of Formentera for further unspoilt beaches on the uninhabited island of Espalmador. For dinner head to Casanita Cantina y Pescado in the village of Es Pujols to try some of their highly reputed grilled fish and seafood. Navigate to Ibiza, the party capital of the world. 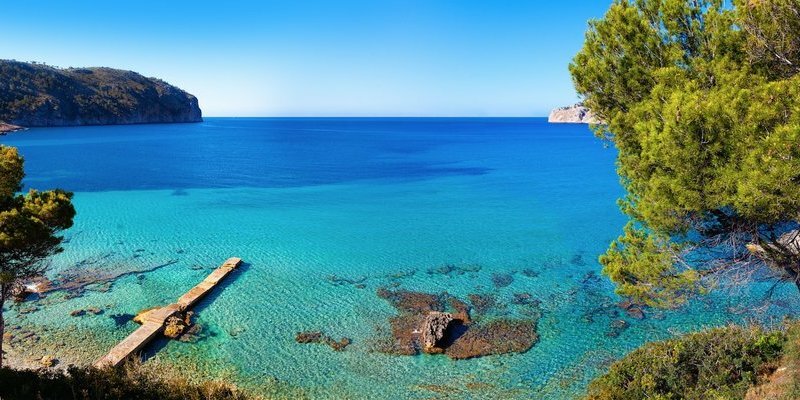 Spend a relaxing day sunbathing on the Cala Comte beach with its tempting turquoise waters. Stay anchored in the bay while you savour a refreshing cocktail and watch the sun go down. Afterwards, sail south west around the island to start the night with some lounge music on the Playa d’en Bossa. From here, move onto the one of the island’s famous nightclubs such as Amnesia or Space, to party until dawn. Spend a leisurely morning sailing to the north of the island to the peaceful resort of Portinatx, a hundred worlds apart from the lively town of Ibiza. One of the island’s best known beauty spots, Portinatx has three sublime beaches to choose from, all with translucent waters making it the ideal place for snorkeling or scuba diving. Enjoy a laid back afternoon relaxing on the beach and going for a gentle swim in the warm aquamarine waters. This morning sail to the luxury destination of Puerto Portals. This port is one of the most elegant in the Mediterranean and is often described as a smaller version of Monte Carlo. The port, with its range of designer boutiques, jewellery shops and perfumeries offers plenty of shopping opportunities. For those who play golf, the nearby the Real Golf de Bendinat is a superb course to try out. There are several high class restaurants in the area including the gastronomic Es Fum and the ideally placed Lila Portals Beach Restaurant. Return to Palma to disembark. Before leaving, take time to wander through the old town, soaking up the timeless atmosphere. To finish the holiday in style, book a table for dinner at Simply Fosh which, with its attention to detail and modern Mediterranean cuisine, was recently awarded a Michelin star.